『용비어천가(龍飛御天歌)』는 훈민정음(訓民正音)이 창제된 후 정음(正音)으로 기록된 최초의 문헌임과 동시에 『월인천강지곡(月印千江之曲)』과 함께 조선시대 악장(樂章) 문학의 대표적 작품으로 평가되고 있는 책으로써, 세종조의 국어학과 서지학 연구에 중요한 자료이다. 계명대학교 소장 『용비어천가』는 전10권 중 권8~권10의 3권으로 자체(字體)는 조선초기에 유행한 조맹부(趙孟頫)의 송설체(松雪體)로 판각한 것이며, 판심(版心)에는 조선초기의 형식인 흑구(黑口)에 내향흑어미(內向黑魚尾)가 있어 초간본으로 추정된다. 그러나 이 책은 장차(章次)에 있어 몇 군데 오각이 있고 수정한 흔적이 있는 것으로 보아 초판본 책판의 수정을 거쳐 인출한 것으로 보인다. Yongbieocheonga (Songs of Dragons Flying in Heaven) is a musical text that eulogizes the founding of the Joseon Dynasty, and is the first text ever written in the Korean alphabet, or Hunminjeongeum (lit. The Correct Sounds for the Instruction of the People), which is nowadays more commonly known as Hangeul. It is of immense historical value as, along with Worincheongangjigok (Songs of the Moon's Reflection on a Thousand Rivers), it is highly representative of the musical texts produced during the Joseon Dynasty. It is also a valuable material for studies of the Korean language and bibliography during the reign of King Sejong of the Joseon Dynasty. 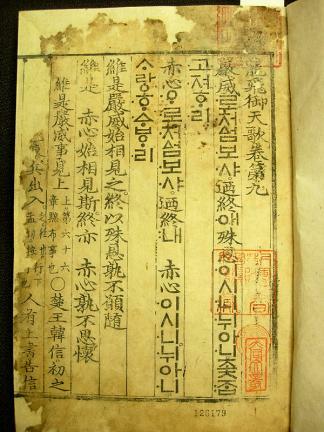 Yongbieocheonga is composed of ten volumes, of which these three (volumes 8 to 10) are preserved at Keimyung University. The characters are written in the calligraphic style of SongXue (whose name derives from the pen-name of the famous Chinese calligrapher Zhao Mengfu), which was popular in the early days of the Joseon Dynasty. 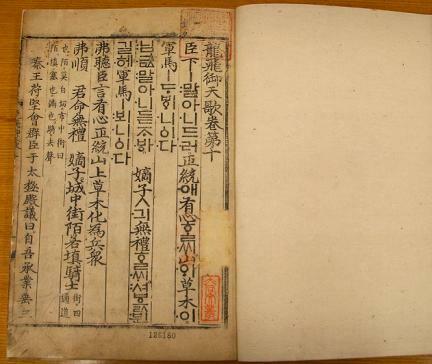 The block styles are consistent with the styles of the early Joseon Dynasty, consisting of black lines and inward-facing heugeomi (black-colored fish tail shapes) at the top and bottom of the pansim (center of the block), suggesting that these books may be first editions. However, as traces can be seen in places where corrections were made to the engravings, these books are presumed to have been printed after corrections were made to the woodblocks of the first edition.